Update: BlackBerry says it has pulled the leaked Android app, and has halted the rollout of the iOS app because demand caused “issues” with its servers. The iOS version still works for those who downloaded it. Many people are saying it’s years too late, but BlackBerry’s BBM messaging service finally landed on iOS today, as it rolls out starting in Asia-Pacific. The app was due on Android at 07:00 ET, but is still to land in the Google Play Store. Many of us are familiar with the service — I personally used it intensively between about 2008 and 2011 — but how has it changed now that it is finally a cross-platform service? In short, you can expect a fairly basic first iteration of a messaging app that is much like the rest, but has a solid base of 60 million active users each month — according to BlackBerry. Given the plethora of messaging apps in the market today, BBM is only going to be of real interest to a few types of people: those who have friends using BlackBerry smartphones, those who recently ditched their BlackBerry or those looking to relive some nostalgia/curiosity. 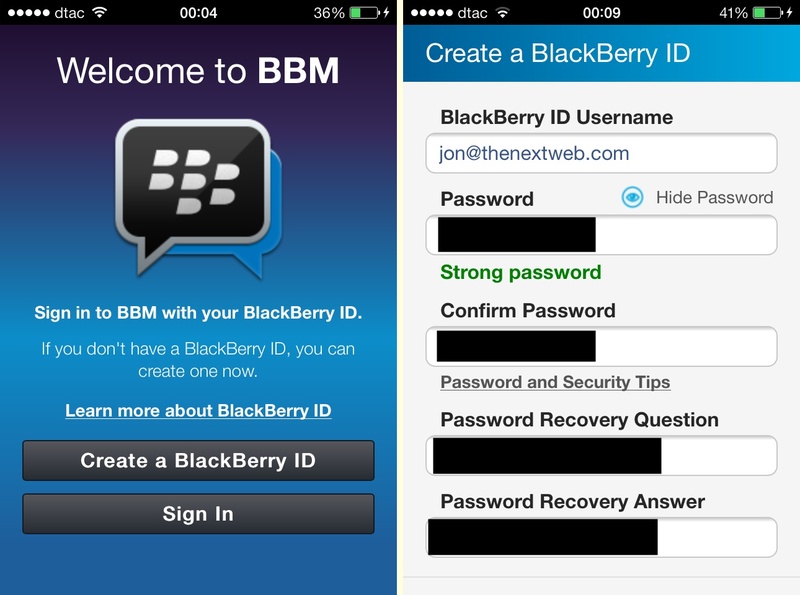 The first step is to key in your BlackBerry ID or, like me, register a new one. 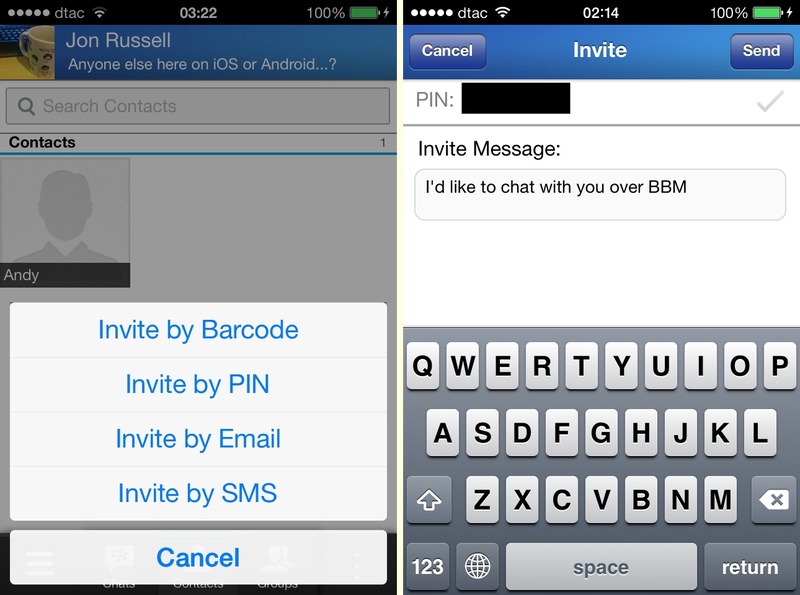 Once, you’re in, you’ll see that BBM is much like any other chat app. A bar on the bottom lets you navigate between chats, contacts and groups. 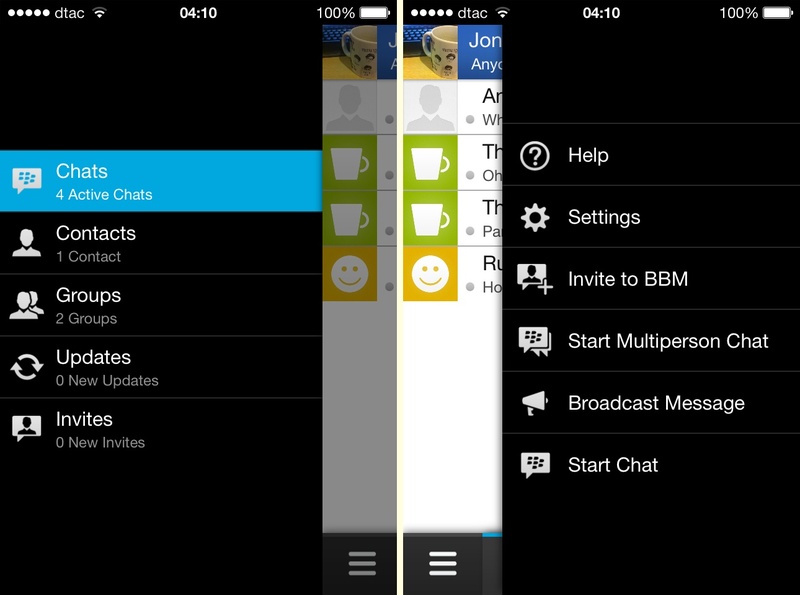 BBM features profiles — with your alias, most recent status and profile photo — which sit at the top of the screen. It’s probably going to start off blank, at this point, like your friend count, unless you’re an existing and active user. Messaging apps need friends, so you’ll be wanting to get some of your contacts in your app. 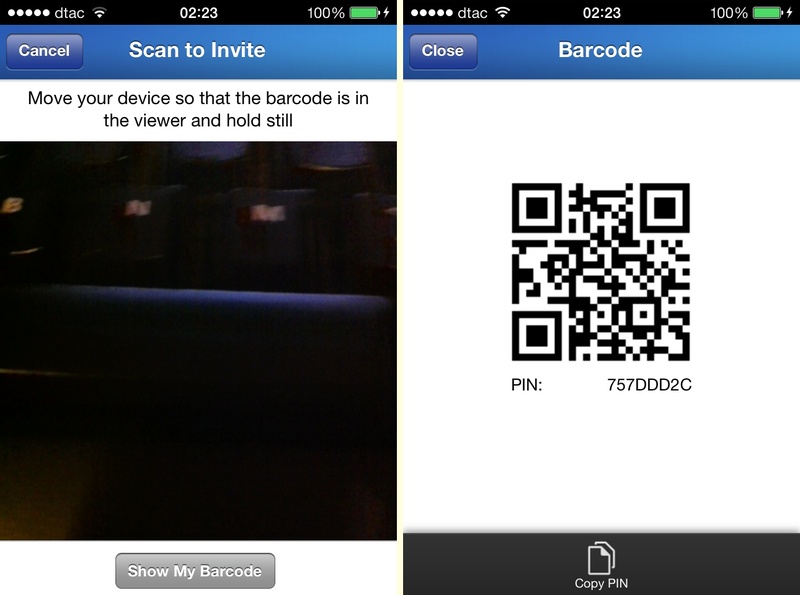 You can invite users to connect in four ways: via SMS, email, their BBM PIN or by scanning their barcode (aka QR code). As with the regular BBM for BlackBerry app, you can give people your PIN or barcode and have them add you too. That can be useful for reaching numerous people via a post on Facebook, for example. In addition to individual chats, BBM offers multi-person chat (you can invite more users from inside an existing one-on-one conversation) and groups, which are like mini social networks. Most of this is standard across all messaging apps. More options can be found in the left- and right-hand side menu bars, which are probably going to be filled with new features, as and when BlackBerry beefs up the app. Chat is exactly as you’d expect. In addition to basic text chat, you can send voice (push-to-talk) messaging and images. There’s a ‘ping’ feature that will buzz the person with a Facebook-poke style reminder to let them know that you’re there. There’s no video or voice call support as the moment, but we’ll come to that later. There are also no stickers — sadly for those in Asia and fans of Path — but you can use emoticons if you like to convey your emotion with images. Like other messaging apps, BBM includes social network-like groups, where users can come together to discuss specific passions and hobbies. Groups are easily set up from within the menu — although it seems that there’s no setting to invite existing contacts to join, instead you can only invite people using PIN or barcode. Perhaps this is an oversight BlackBerry will fix? Groups can be given profile images, descriptions and more to give them some character. They consist of four elements: chats, pictures, lists and events. So, in effect, they function very much like a Facebook group. The second, social network-style feature is profiles, which, again, are very much part of other apps, such as Line or WeChat. BBM allows you to set a profile image, alias, status and add comments. Each user’s profile includes ‘updates,’ which show changes to their display picture, status, comments etc. You can see all of your friends updates from the left-hand side bar, which aggregates them like a Facebook-style timeline. 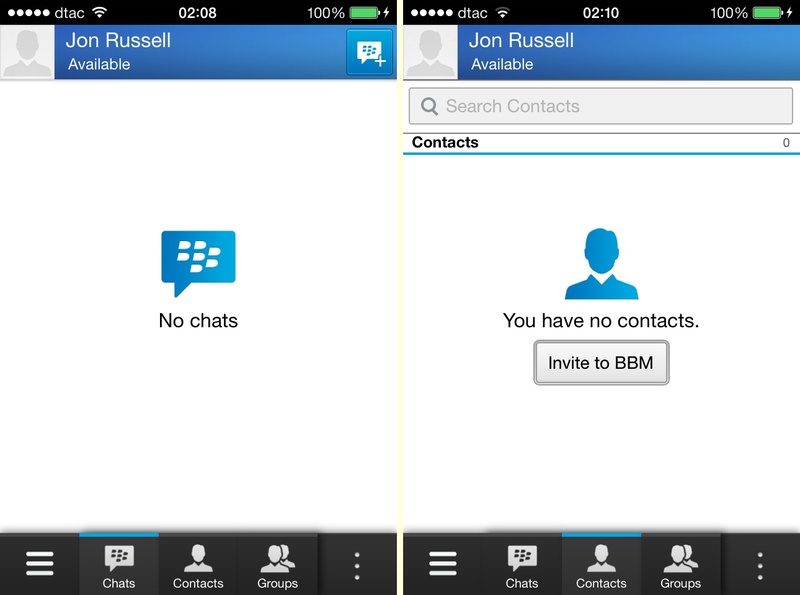 BBM also lets users broadcast specific messages to selected contacts, which can be found on the right-hand side bar. So if you have something to say to some people in particular, this will do that without alerting all of your contacts. That right-hand side bar contains a range of other options, including ‘settings,’ which lets you toggle in-app options, including whether to show your location and timezone, music status updates (which will come soon) and more. BBM is more advanced on the BlackBerry platform, and this iOS-Android version is very much an initial launch effort. 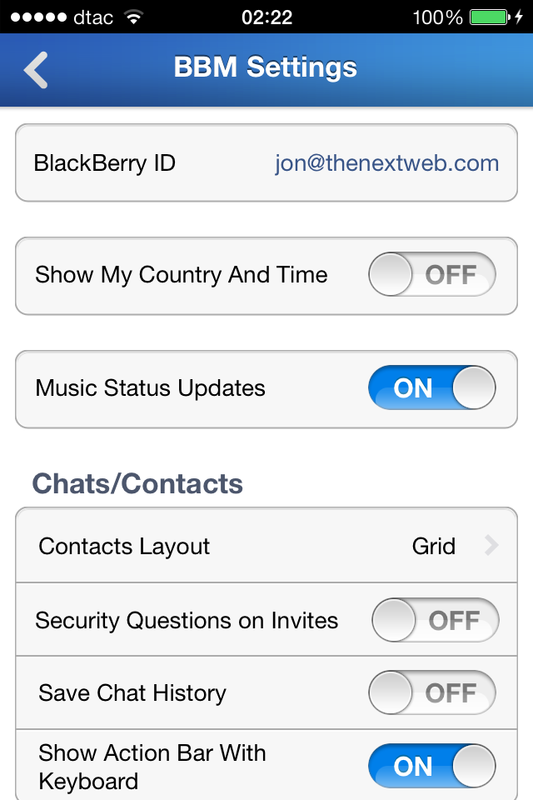 BlackBerry said this week it will introduce BBM Channels soon. The company markets the feature as a medium to connect friends, strangers, brands and celebrities around shared topics, but it could become a lucrative marketing channel, like those that Line and others have pursued. Video and voice calling — two big features noticeably absent at this point — will come to “a future version” of the Android and iOS apps too, the company says. There’s nothing groundbreaking in BBM. Kik, Tango and Asian messaging apps like Line, Kakao Talk and WeChat are moving into gaming and content platforms, but BlackBerry remains firmly rooted in connecting people. While it is richer in features than WhatsApp, that’s true for most apps since WhatsApp’s appeal remains simplicity: allowing mums and even grandparents to use it. On that front BBM is likely to prove more confusing to less tech-savvy users given the array of options and menu bars. Ultimately, this release is years too late to matter for the average smartphone owner. If you still have friends who own BlackBerry devices, then it could be an interesting option. But most people haven’t waited for this and use WhatsApp (among others) to connect with friends across multiple mobile platforms. It’s true that the likes of WhatsApp (300 million monthly users), WeChat (235 million monthly users) and others are well ahead of BlackBerry and its 60 million users, but BBM is important for BlackBerry in the run-up to its potential sale. The company’s smartphones are some way behind Android, iOS and Windows Phone devices for most consumers in the West and Asia, but messaging apps are in vogue and BBM has a decent pool of users who send and receive 10 billion messages per day. If it can gain some momentum as a cross-platform app — or even just hold its current numbers — then BBM could become an attractive part of a deal to buy BlackBerry, or perhaps a separate asset for sale. WhatsApp was said to have caught Google and Facebook’s interest with potential billion dollar deals — while it would fetch a lot less, BBM could have its suitors. I’m interested to see how BBM gets on. I don’t think it will lure users who are entrenched in existing messaging apps away from what they already use, but it does enjoy a sizable audience in Africa and still has an enterprise presence, particularly in the UK. What do you think of the app? Will you be using it?